So, one of the most well-known names in British skincare releases a line of makeup. Women everywhere go crazy. 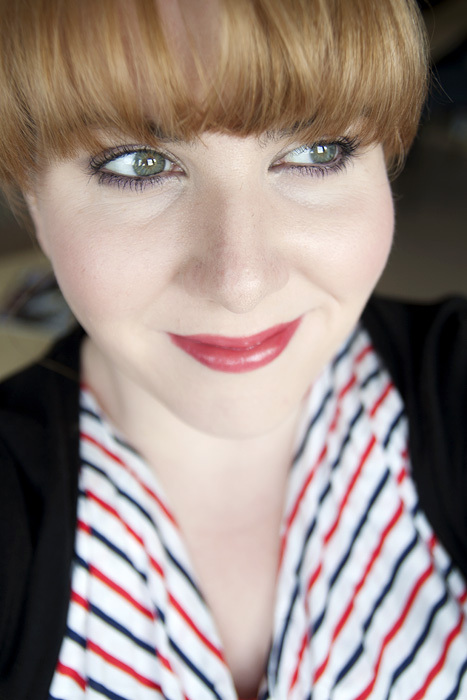 This lipstick-loving chick gets a bit twitchy over the thought of a Liz Earle lipstick… but I don’t mind admitting that I’d been having preconceptions about how it would feel/look. I imagined that it would be sheer, moisturising… a bit balmy. Manna from heaven to some, but not to me. I was wrong though, it’s basically the complete opposite. Aren’t you glad to be following the blog of someone who clearly has absolutely no beauty foresight whatsoever. It’s like when I get emailed to give my opinion on future trends. I usually look behind me to see if there’s someone else in the room the email was directed to. Then I say “coral”. 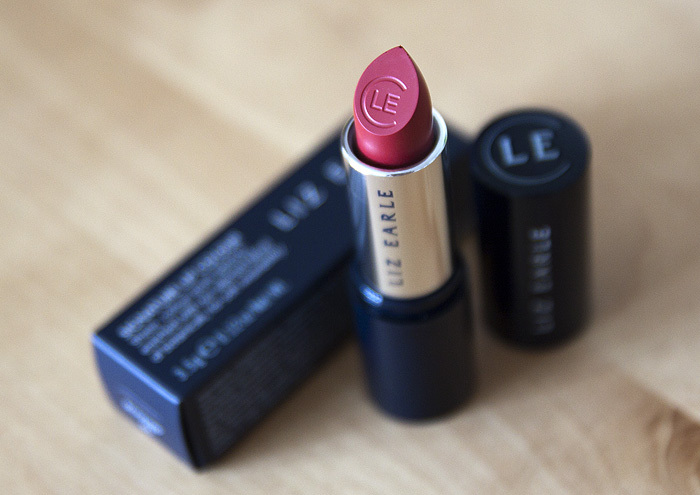 The Liz Earle Signature Lipstick in 01 Rosehip is a natty little bullet of pigmentation with a satin finish. But I don’t love it. The shade is very pretty, a muted red which makes for a great pop of colour on pale skin but it draaaaaaags on my lips like a fat dog resisting its daily walk. You can even see the drag marks on the back of my hand! It needs more slip, it needs more glide! Sure it gets better once you’ve spent five minutes drawing it over your lips warming it up but I don’t have time in the morning to resuscitate my lipstick before applying it and I can only imagine the texture getting worse as the temperature drops further. All in all, this has to be a no from me. Pretty colour, class packaging and lovely embossing on the bullet that gives it the elegance you’d expect from the brand but the formula doesn’t do it for me. * I should say that after writing my review and googling to see if anyone had a similar experience, I’m the lone voice of dissent which is making me wonder if I got a bad one. I’ve just noticed I’ve got a HAIRY hand too. 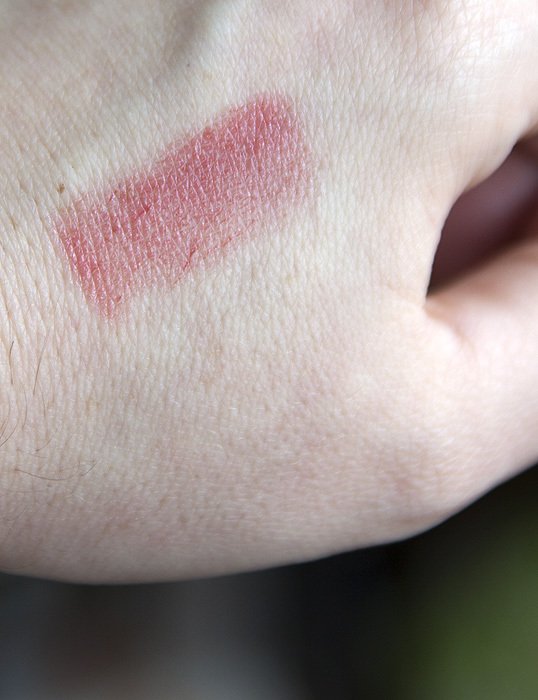 The shade reminds me of Viva Glam Cyndi (which is not draggy but also not available any more…) and Revlon lip butter in Candy Apple so it might be worth checking out the latter if you really love the colour. It really suits you! It does look pretty, as does the hair. But meh. I’d want it to be as perfect as the Cleanse and Polish. Hoping mine is just a bit of an off one, other reviews seem more positive! Colour looks absolutely fabulous on you. I bought Hibiscus and I totally agree with you about the texture. It went on with a waxy drag and sat on my lips stickily. I like the colour and agree that Rosehip really suits you. Maybe one needs to wack up the central heating to full blast to get the sheer buttery texture other reviews mention? I was interested to read you had difficulty finding negative reviews for Liz Earle products. I think the answer is that this company go out of their way to avoid publishing anything that doesn’t sing their praises. I did review their tinted moisturiser sent to me last year, it didn’t suit and I said so, plus I suggested maybe it wasn’t suitable for sensitive skins. My review never appeared on their website. I sent an email some time later asking why I could only see positive reviews of this product and eventually received an email to say someone would be in touch to discuss my concerns … I never heard another word. IMATS London 2011 – The Countdown Begins!